Saving up to buy your first home isn’t easy and there are lots of extra costs in addition to your deposit that you’ll need to consider. We'll let you know what they are so you'll know what you need to save! If you’re a first-time buyer you probably already know that you’ll need to save a deposit of at least 10% of the purchase price of the house. So a house worth €300,000 will require savings of at least €30,000. However there are a few other hefty costs which you’ll need to save for before a bank will consider your mortgage application. This is probably the biggest extra cost you’ll need to save for. The rates of stamp duty are below and they apply to both first-time buyers and second-time buyers. So a house worth €300,000 would have stamp duty of €3,000. If you’re buying a brand new home, however, it’s a little different. In this instance, the rate of stamp duty is the same, but the rate is applied to the price of the house excluding VAT. VAT is levied at 13.5% on new houses in Ireland so the stamp duty you’d pay on a new house worth €300,000 is actually only €2,595 (1% of €300,000 less 13.5%). At a minimum your bank will want to see that you've saved enough for your deposit and the stamp duty before they'll approve your mortgage application. Your solicitor is responsible for conveyancing, which means they’ll conduct all the legal tasks required to transfer ownership of the property to you. Some solicitors will charge a flat fee while others will charge a percentage of the house price, usually around 1% or 2%. 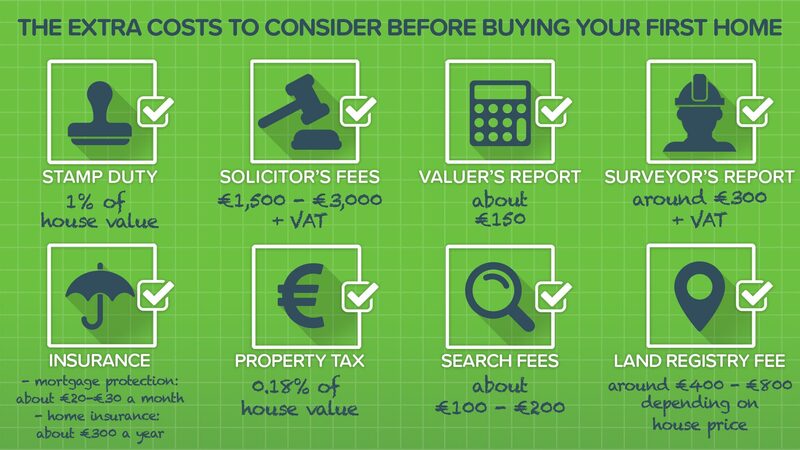 Remember to shop around but be prepared to pay anything from €1,500 to €3,000 plus VAT. And when getting a quote, always be sure to confirm if the price is including or excluding VAT. Your lender will want to be sure that you’re paying a fair price for your new home so they’ll also request a valuer’s report. A valuer's job is to give your lender an estimate of the property’s market value to make sure you're not paying over the odds. Your lender will usually have their own valuer who they’ll use for this purpose but you’ll still have to pay for the report yourself. You can expect to pay around €150 plus VAT. Before buying a home it’s also a good idea to get a professional surveyor’s report carried out. This report will identify any hidden defects or structural issues with the house such as condensation, damp, dry rot or pyrite. Getting a surveyor’s report may or may not be required by your lender and a negative report doesn’t necessarily mean you can’t buy the house. It just means you know exactly what you’re buying before you make one of the biggest financial decisions of your life! You should budget around €300 plus VAT for the report. There are also extra costs with owning a home that you probably aren’t used to paying if you’re a renter or living at home such as mortgage protection, home insurance, and property tax and these need to be considered too. Most lenders will require that you take out mortgage protection. This is a form of life insurance that will pay off the balance of your mortgage in the event of your death. How much you pay will depend on your age, health, and the size of your mortgage, but expect to pay at least €20-30 a month for the lifetime of your mortgage. Similarly, lenders will require that you take out home insurance to protect your house and its contents in the event of fire or storm damage etc, with policies costing from around €300 a year. Most banks sell their own mortgage and home insurance but remember you’re not obliged to buy it from them so shop around for the best deals! Finally there’s the property tax, almost as popular as water charges! This is a self-assessed tax paid annually to Revenue and is based on the market value of your house. A house valued at €300,000 can expect to pay tax of around €500 a year. If you're still in the early stages of buying your first home, or you're looking to switch mortgage lenders, remember that you can compare rates from all the banks using our handy mortgage comparison tool.